Taiwan holds strong potential for renewable energies. The country wants to phase out nuclear energy by as early as 2025. In the past it had accounted for up to 20 per cent of power generation. “Taiwan is a strategically important market for us. That’s why we are very pleased to be advancing offshore wind projects from our own office in Taipeh now,” stated Dr. Hans-Josef Zimmer, Chief Technical Officer of EnBW during the inauguration. Some 70 high-ranking guests from business, politics and science had followed the invitation. 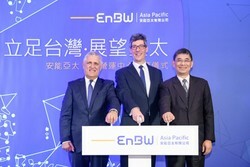 Together with Australian investor Macquarie Capital and the Taiwanese industrial company Swancor Renewable, EnBW has developed three offshore wind power projects in Taiwan’s Changhua region since early 2018. The projects offer the potential to build wind power plants with a total volume of up to 2,000 megawatts. It is an output that matches that of up to three conventional power plants. To achieve this, EnBW had acquired a 37.5 per cent stake in the project, called “Formosa 3”. Currently the partners are preparing the projects for the third offshore auction in Taiwan, which is planned for this year.EnBW has assembled an eleven-member team of experts in Taipei which works closely with ENBW’s offshore office in Hamburg. The local team ensures proximity and short routes to cooperation partners in the area, approval authorities and potential local suppliers.